Hello! 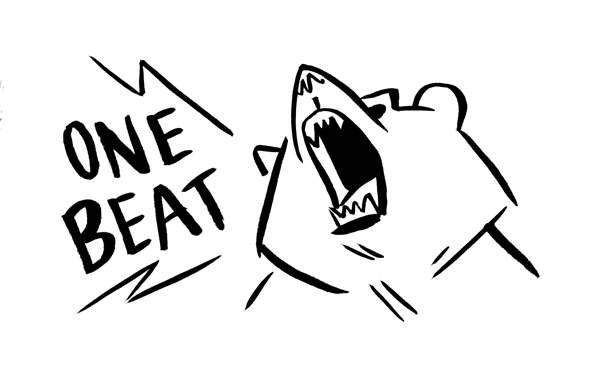 Welcome to the first post on the One Beat Zine Collective website! 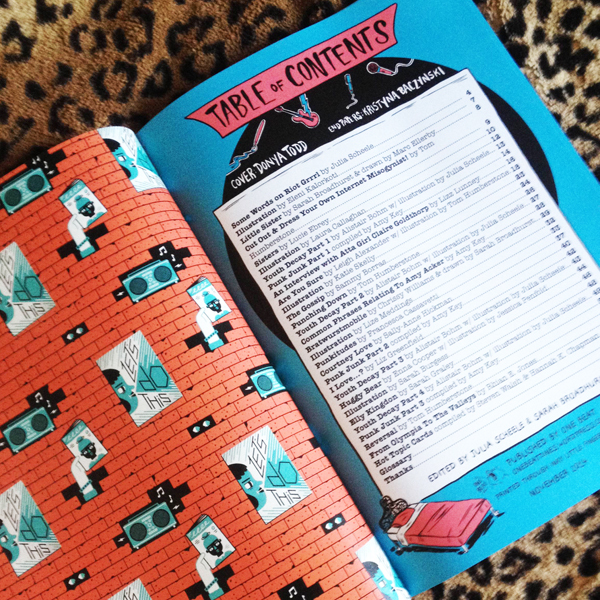 When I first had the idea to put together a Riot Grrrl zine, I soon realised that it was a massive job which I could barely do on on my own – thankfully, my most excellent friend Sarah Broadhurst offered her help, and pretty much saved my life on this. 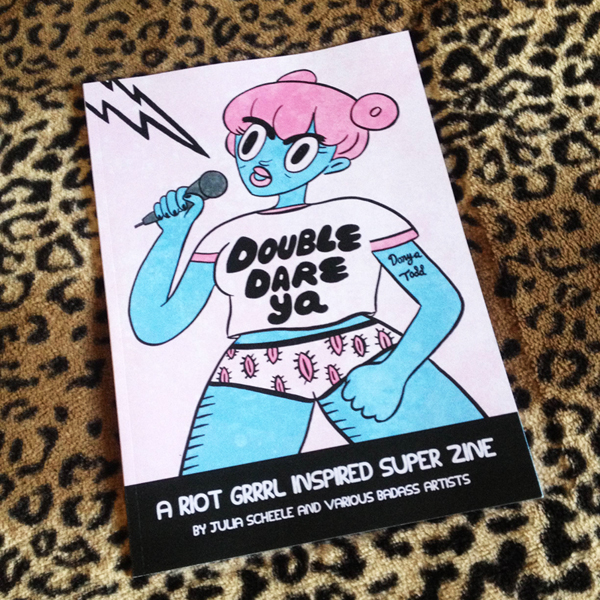 Which gave us the idea to form this collective – both Sarah and I are passionate about many of the same things, above all feminism, music and comics, so, here we are, as One Beat Zines! 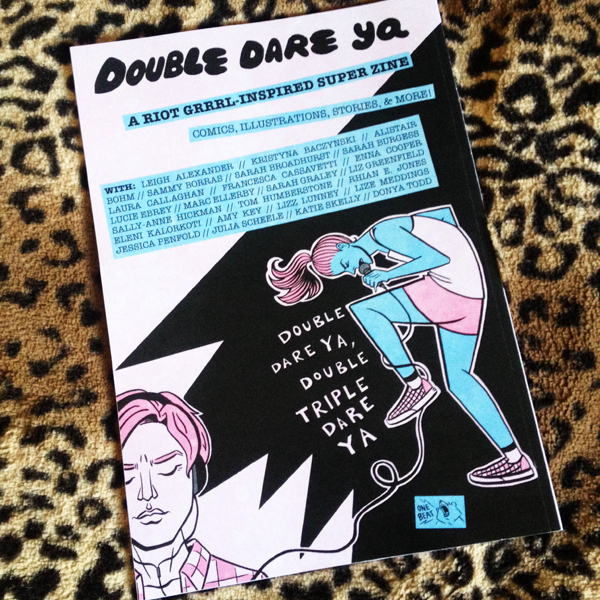 One Beat is proud to present Double Dare Ya, a full-colour anthology featuring comics, illustrations, essays, and interviews about and inspired by Riot Grrrl, zine culture, and punk-rock feminism! Contributors range from UK and international comics artists and illustrators, poets, to journalists/writer. The cover is by Donya Todd, and the book has beautiful end papers designed by Kristyna Baczynski. 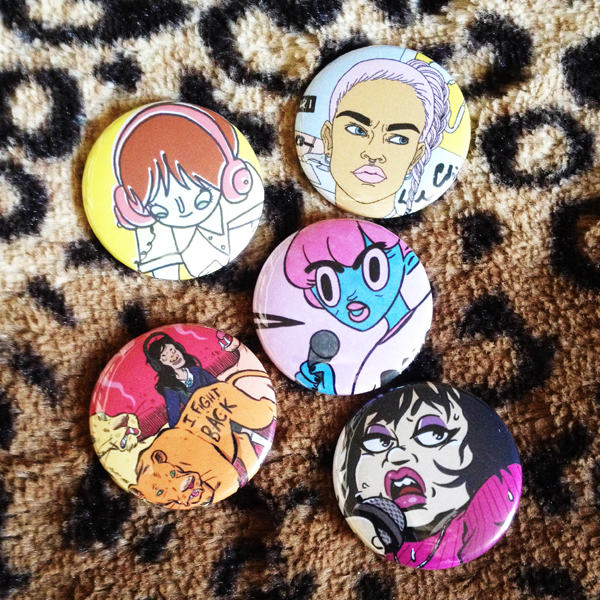 Plus there’s 38-mm badges by Donya Todd, Laura Callaghan, Katie Skelly, Lucie Ebrey and Sammy Borras! You’ll find a full list of contributors at the end of the post. The first 250 copies of the book include one random Hot Topic trading card out of 57, based on the names mentioned in the song Hot Topic by Le Tigre – the cards are all illustrated by different artists and were put together by Steven Walsh and Hannah K. Chapman. The book is in A4, has 66 pages, retails at £12, and will be available first at Thought Bubble Festival in Leeds, on the 15th and 16th of November (we’ll be at Table 144 in New Dock Hall – come say hi!) 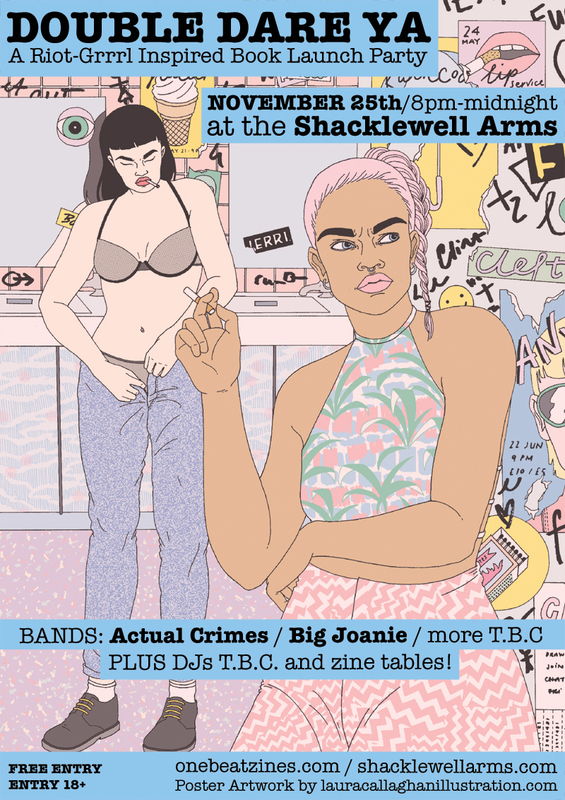 – after that, we’ll have copies to sell at our London Launch party (featuring bands and Djs!) at the Shacklewell Arms on Tuesday, the 25th of November – and after that, we’ll set up and online store with everything that’s left! There’s a Facebook event for the London launch here, if FB is how you roll. You can listen here to Actual Crimes, and here to Big Joanie! Thanks for reading – we hope you’re as excited about this as we are, and to see you at Thought Bubble or the launch party!